This year I was invited to the Techno Summit event organized by National Institute of Fashion Technology (NIFT), New Delhi branch. In that summit, top research projects were presented by NIFT students from B.F.Tech and M.F. Tech. I liked most of the projects students undergone in their last semester. Some of the presented projects were innovative and viable for implementing in the manufacturing facilities. I have listed here 5 project topics, those are innovative as well as interesting for working further on those areas. Apparel production students who will be perusing graduation project in the coming years can work further on this areas. I will not share project details but list down the name of the project areas, as most of these projects are applying for the patent. In case you are interested, you can contact NIFT center for further information. You might know that as a precaution to avoid shade variation in the garment, all garment parts are marked by stickers prior to bundling. This process is called as ply numbering. Ply numbering is also done to match sizes of different parts of a garment. This process is still done manually by using a hand ply numbering machine (as shown in the below image#1). The fabric ply numbering process can be automated by a robotic device or a mechanical device. A NIFT student has developed a miniature of mechanical device to automate this process. Though the speed of this slow at this stage. By implementing this kind robotic or mechanical devices garment factory can reduce manpower in cutting section. 2. 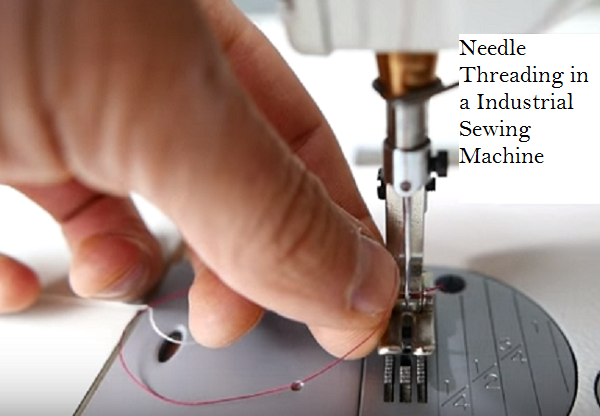 Developing automatic needle threader for an industrial sewing machine. 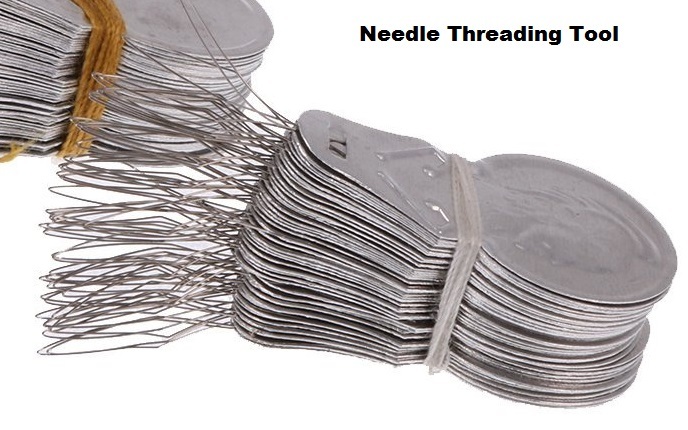 How the needle threading is done in your factory? Obviously, it is done manually by the sewing operator (As shown in the image#2). Or someone may be using a device to ease the needle threading (See image#3). But automatic needle threading is possible. A project is done by NIFT student in this area. The shade variation is a big issue in fabrics. Garment factories take care of separating fabrics of different shades and prepare a shade band. Later fabrics are sorted according to the approved shade band. If the shade is out of the approved shade band fabric is rejected or send back to fabric processor for reprocessing. The shade identification is done visually. An equipment (based on a sensor ) can help in doing shade banding of fabrics of different shades in the same color. At present, the real-time production data tracking systems those are RFID technology or touch button based are costly. That is why only very few garment manufacturers have adopted the real-time production tracking systems. Most of the garment business owners are aware of the advantages of the real-time data in managing shop floor, improving the floor performance and controlling the production cost. A low-cost application for real-time shop floor data tracking for the garment manufacturing industry would be accepted widely. The student, doing this project, estimated the cost of implementing his designed system would be cost-effective. This is not a new topic but factories need to think about how they can reduce power consumption in their factories and make their workplace energy efficient. One example shared by the student about garment pressing and garment inspection section. Pressing and inspection section may not have work for all the time. So they can switch off lights when they are don't have work or if nobody present in the workstation. The student worked on how the lighting at the workplace can be automated and no one needs to press stitch to on and off the light. These research topics are shared in this post just for your information. If you are a student, you might get inspired and can find a better research topic. Every year apparel production students from various colleges ask me for research topic ideas. If you have any good research topic idea for apparel students, you can share it on this platform. Top research projects done by NIFT students in 2017. Development of auto ply numbering device, needle threading device, fabric shade banding equipment etc.